Highways England and the DfT are implementing a Government programme to help reduce the number of collisions and casualties on our roads. In doing so, the aim is to reduce the considerable pressure on resources, both human and financial, in dealing with road incidents involving those who use our roads for work. Having recently awarded the first contracts under the Area 10 ALD framework (the first to contain new requirements relating to the management of work-related road risk), Highways England are pressing forward, as a matter of urgency, with its desire for their supply chain to display exemplary standards in how they manage this vital area of health and safety. 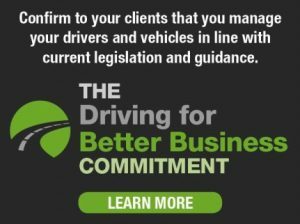 The Driving for Better Business team will be holding a one hour workshop at Highways UK to give you the chance to understand what Highways England expects of its contractors, and the free resources available to help you implement them. The session will be opened by Highways England’s Chief Executive Jim O’Sullivan, followed with a short presentation by James Haluch, Managing Director of Amey Highways, our latest Driving for Better Business Champion.